Terry D. Roberson, 56, of Mayfield, Kentucky passed away 3:16 p.m. Sunday, February 3, 2019, at University of Louisville Hospital in Louisville, Kentucky. He was a former resident of Troy. Graveside services will be conducted 10:30 a.m. Wednesday at Mayfield Memory Gardens. Visitation will be held at Edmaiston Mosley Funeral Home from 5:00 p.m. until 7:00 p.m. Tuesday. Terry was born July 14, 1962, in Union City, son of the late Gene and Janice (Hooper) Roberson. He had been employed as a guard at the Northwest Tennessee Correctional Facility in Tiptonville for 17 years and had been employed in the family business Signs and Signs in Mayfield. 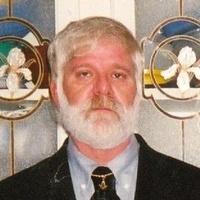 Terry had served in the United States Marine Corps, was a Mason and a member of Troy United Methodist Church. He is survived by his sister and brother-in-law, Teresa and Nickey Sadler of Troy; and three nephews, Rob Wiggins and Jake Sadler both of Troy and Reid Wiggins of Franklin. He was also preceded in death by his son, Adam Roberson; and his brother, Danny Roberson.